I do too~it is a very graceful image. Not surprisingly—but of course modestly—I have the same opinion. polar opposite in color, texture, form, etc…. yet those colors are complementary ones, and they work! 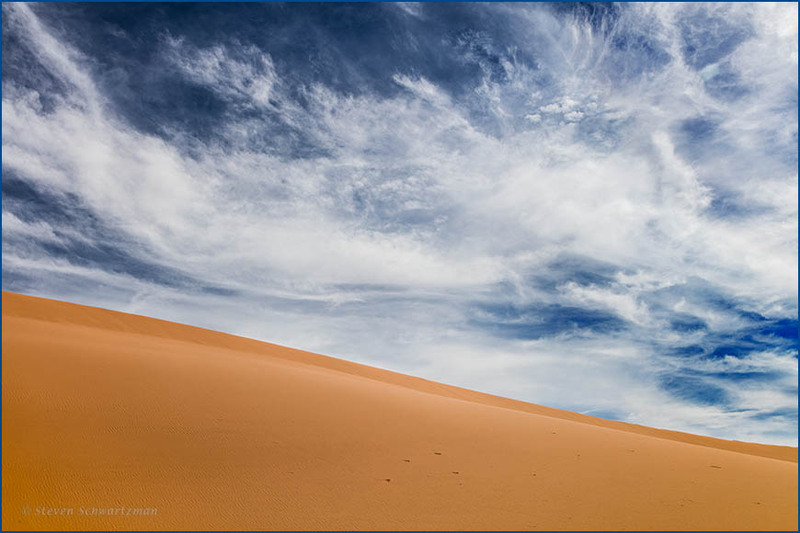 I was thrilled to find those wispy clouds that I could “cover” the dunes with. The lower portion of the image struck me as the flank of a human body. si, it had an interesting sheen almost like plastic! This photo may have been taken in Southern Utah, but it could be a perfect illustration for the story of Rangi the sky, the father of all things, and Papa the earth, the mother of all things. It’s remarkable how the New Zealand myth contains echoes of Genesis creation myths: or perhaps not. Now that’s an ingenious connection. I know people have studied creation myths, but I don’t know what conclusions they’ve come to about their universality. Eve was saying just today that we’ve seen nothing in New Zealand like the colorfully picturesque formations of the American Southwest. One of my readers recently mentioned Uluru in Australia — out near Alice Springs. Perhaps you should pop over for a visit. They recently had some remarkable rains, which led to some remarkable images. Uluru is a place I’ve long wanted to visit. It’s too far for this trip, but Australia warrants a trip of its own. Yesterday I saw on television the danger of flooding in Oroville, California. I’d never heard of the dam there, which I’ve learned is the highest in the United States. Nice color combination as well as textural contrast and composition, Steve. Curious about the Pink moniker as I see more sienna. Maybe the light has to be different? I wondered about the “pink” too. Like you, I see the color as leaning more toward sienna or orange. I don’t know if the right light can make the sand look truly pink. My intuition is that it can’t. Hey Steve a great combination .. I couldn’t get enough of it and kept taking pictures with different compositions, some horizontal and others vertical.